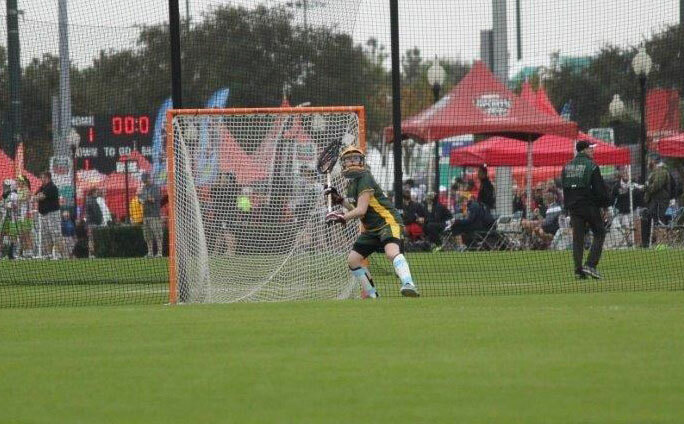 The CMass Green and Gold Teams combined forces and enjoyed great success at the recent Capital Cup, a prestigious tournament hosted by the IWLCA (Intercollegiate Women’s Lacrosse Coaches Association). The Capital Cup was held in Midlothian VA, just outside Richmond and was attended by hundreds of college coaches and 246 teams. The Team won all 4 games, defeating team from Michigan, Maryland, Long Island and Central New York State. CMass prepared for the Capital Cup by participating in three extremely competitive recruiting tournaments, playing some of the top club teams in the country: The Northern Draw, Project 120 and the Northern Rise. The CMass girls truly peaked at the right time. Strong team camaraderie, a CMass staple, played a key role in the team’s success. The undefeated weekend was led by our goalies Anna Downs (Wayland) and Maria Antonellis (Groton); both were outstanding in goal, combining for a 62 % save percentage. Both goalies came up big in tight, low scoring games. CMass scoring was very evenly dispersed with Katie Peters ( Medway) leading the team in scoring with 11 goals, followed by Caroline Trabucco( Shrewsbury) with 7 goals, Gianna DiPinto (Grafton ) with 5 goals, Hannah Sugarman ( Holden) and Lauren Lyver (Grafton) each with 3 goals. Jena Reichheld( Shrewsbury) Rachel St Pierre ( Shrewsbury) , Michala Sockol (Westboro), Erica Sudol (Westboro) and Samantha Jones ( Franklin) also scored at least one goal. Diana Griffin (Franklin) and DiPinto won numerous draw controls and Olivia Aumais (Groton) and Victoria Zygouras ( Ashland) caused numerous turnovers with their strong midfield play while Leanna Klein ( Ashland) was also a force at Attack. The CMass defense, led by Jones (Franklin ), Kerrin O’Leary ( Millbury) , Abbie McCarthy ( 2014) Olivia Truenow( Franklin) Cassie Moisan (Grafton) and Kiana Oteyza (Shrewsbury)held opponents to a mere 6 PPG. Each came up with key ground balls and caused turnovers throughout the tournament. The CMass team was led by Coaches Kim Hamilton (University of NH) Chelsea McLeod (Wheaton College) and Karl Moisan (Norwich University). Central Mass Club Lacrosse will begin its 8th season with tryouts on August 11th and 18 at St. Mark’s School in Southborough. For tryout details, go to www.cmasslacrosse.net or contact CMass Director Joe Kacevich at 508-365-7486 or joe.cmasslax@gmail.com.